It is technically still morning. I couldn’t decide what I wanted to do this morning. 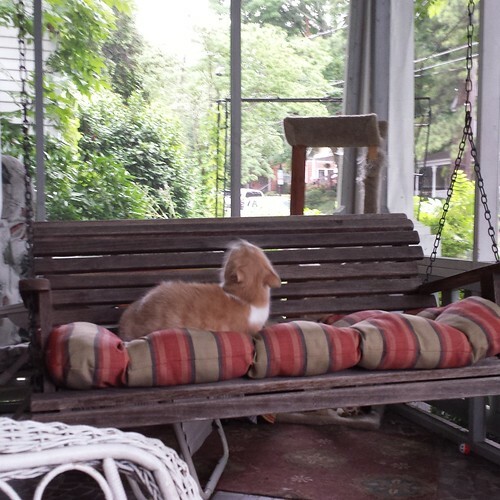 The cool breeze on the front porch is delightful and it is so nice to share that space with my cats. Pablocito has taken to sleeping on the swing since Diego has won the battle of territory over the cat tower. I set up a table with a cushion next to the cat tower and Diego has claimed that too. It is odd that Pablocito rules the cat food bowls but Diego is Top Cat in all other things. Anyway, I’ve been re-reading Zen and the Art of Motorcycle Maintenance and I made another pot of coffee. Mr. Wiggleworm wouldn’t hold still. I managed to make even more room in the studio this week, and several of my plastic containers are heading to Reconsidered Goods or Goodwill, thanks to a gift from ZhaK of several cigar boxes and tins and candy boxes and a basket. I tackled the dreaded top drawer of my mother’s dresser which I have been filling with whatnot on top of her stuff, and as most objects of dread are, it was not nearly as bad as I thought it would be. After four years I think I am coming to some peace about my mother’s passing. Fringeless, the online class by Rebecca Mezoff and Sarah Swett, begins on July 9. I took apart my copper pipe loom with the idea that I’d use the pipes for dyeing, and then realized that I would need it for this class. This is the pipe loom that I had the problem of it torqueing under tension. I glued the joints back together with super glue, except for the connection with the feet, which I want to be able to remove or adjust, and I hope this will help the torqueing problem, otherwise I will be be looking for someone who will solder it for me. My mind is calming down. I’ve been able to sleep better. Thinking about aging in place more as I’ve realized how difficult it would be to emigrate somewhere that is not hot and humid. We still plan to visit Portugal and Spain next year. I will try to talk Sandy into limiting it to Portugal. I’ve learned that the temptation to do more often leads to me feeling frustrated and exhausted. Sandy has always “had eyes bigger than his stomach” in most things, and while it is easy for him to convince me to go wider (who doesn’t want more of a good thing? ), I am more of the opinion that it is better to go deeper. The silver maple tree was supposed to be in the process of coming down today, but we had a miscommunication with the arborist, so it has been rescheduled to August 2. That was probably a good thing since a big storm came through yesterday and blew a lot of my tomato cages over. I will need to go out and stake them today. The high is only supposed to get up to 77 degrees today! So nice after days of 90 plus and humid, and we get to give our AC and fan motors a break. I can’t decide what to do next in the studio. 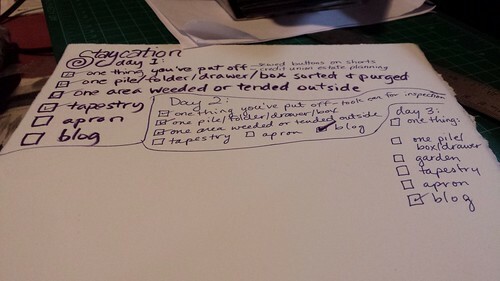 My hands are hurting from too much mouse use at work and game playing and book holding so I think that I might get the sewing machine out, see if it forgives me after the accordion book project. If not, maybe it’s time to open up my mother’s Singer cabinet. I will head down to Lake Waccamaw for a spell later and that will be a great place to hand stitch and dye, if I am good to my hands now. Okay, that’s enough. The church bells are playing hymns (ARGHHHHHHHHHH) and so I know that it is noon. I also know that the name of the song is “The Church’s One Foundation” and I see and hear the inside of Bear Swamp Baptist Church, my mother and father next to me in the pew. This might seem comforting to others. I hope that one day it might be that way for me, because I do not foresee us moving from here nor do I foresee the church stopping its twice daily hymn playing. 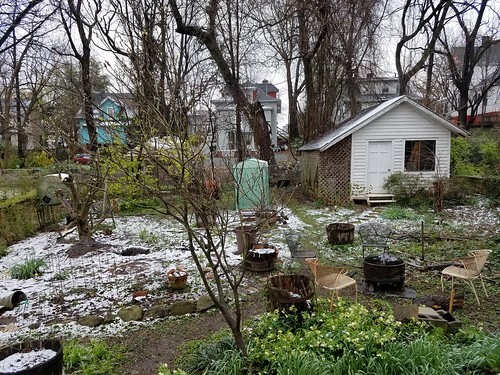 But the day is beautiful, the flowers in the hugelkultur bed are beginning to bloom, and the garden is calling. This is a good place. I am lucky to live here. Ugh, what an awful week the past week was. Back to work, bored out of my mind, no mental energy to do anything much when I got home at night other than numb my anxious mind with playing solitaire and watching TV. I spent time researching emigration to various countries, and reading advice from ex-pats online. At least I cooked two nights and got laundry done. Friday night and Saturday was fun, though. So, my staycation. Yes. I got so revved up about purging the studio that I plunged into it and didn’t do much of anything else for the rest of the week! It was great, though. I doubled my goal of getting rid of five large boxes of stuff. Much of it went to Reconsidered Goods, some went to a teacher at Hirsch Wellness Network, and I’m still putting stuff to the side for Goodwill or wherever. I got all the cardboard boxes off the floor, condensed most of them into one or two boxes, and cleaned the floor and the rugs. It took so much more time that I thought it would, but it was totally worth taking the week off to do it. On the weekend, Sandy and I moved everything off the front porch and mopped and cleaned and repainted a chair and got rid of a lot of stuff that was cluttering it up. Bought new cushions for the swing and the wicker chairs. We found a wicker table at Reconsidered Goods that matches my mother’s wicker rocker perfectly! Pablocito had a couple of tough days because we consigned his wobbly cat perch to the garbage bin, but he seems to have adjusted now. Because the state of North Carolina often gives its employees extra time off and small bonuses in lieu of adequate pay raises, I am rich in vacation time. For the most part, I love this. I spent years working at places that didn’t give sick time at all, maybe one week of vacation, or they required you to work so much that you couldn’t take it anyway. As I am looking retirement in the face, I can see that as far as my Social Security goes it would have been better to have the salary increases. Sandy and I are making a will, finally, in case that we both go at the same time, and considering our retirement options. Sandy is now on Medicare, and is going to try to wait until age 70 for his Social Security. I am considering taking my Social Security and 85% of my state pension at age 62, which is about five years from now. I can’t leave this job until I get to age 62, at least. Then I’ll look at my options. Sandy deserves to retire and perhaps we will emigrate. It would be best if we did it together. Maybe we will check out Portugal next year. Costa Rica? Sadly, I don’t think that we could afford Ireland. I’d prefer an English-speaking country, since I can barely make myself understood in English, much less other languages. I’ve taken French, Spanish, and Italian, and now I get them all mixed up and can’t even get my numbers right. I realize that we will probably end up here, but I’d like to have the option of leaving. I worry that by the time I am 62, no other countries will let us in, and who could blame them? I think that the greatest and the worst thing about the staycation is that it showed me a little of what life might be like after retirement on a daily living scale. The difference being that Sandy would be at home all day, and we would probably eventually get on each other’s nerves. It would be nice to have the time and energy to keep this house clean and cook healthy meals, not to mention the studio time I’d have. Physically, I am better. I saw a new chiropractor for twelve adjustments and there is a big difference in my neck and shoulders. My hips are still a problem, but much better. There really isn’t much more that can be done since arthritis is the ultimate cause and it can’t be reversed. But it can be managed a lot better than I’ve been doing, and I’m not taking nearly as much ibuprofen. There are exercises that I need to remember to do! I have switched over to taking turmeric and I’ll still see both my chiropractor and massage therapist once a month to keep me on track with my progress. My elbow and hands, well, I just have to take a lot of breaks. Friday night we went to the Solstice celebration at Weatherspoon Art Museum, which is just a block from our house, and saw the exhibits and took a photo in the “photo booth.” There is a film showing there in one of the small galleries on the first floor, migration (empire) that is stunningly beautiful and I recommend it highly. I might go back and watch it again. 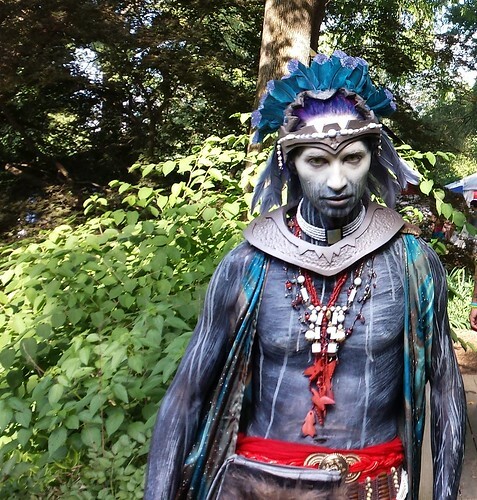 We went to the Greensboro Summer Solstice Festival on Saturday afternoon, which gets bigger and more spectacular every year. I didn’t have a good charge on my camera so I only took one photo – I think that this guy had the most impressive costume, although he had a lot of competition. And the Back Forty is in transition. I’ve transferred what lettuce seedlings I could find to the container on the front steps wall, and moved a few tomato seedlings back to where the Jacob’s Cattle beans were. Ground cherry plants have popped up randomly here and there and I’m happy to see them! The groundhog family (yes, I’m pretty sure I saw a baby) are in control. They finally pushed over the wire cage I had staked down over my broccoli in one of the planters and ate the rest of it. Also, carrot tops are gone. 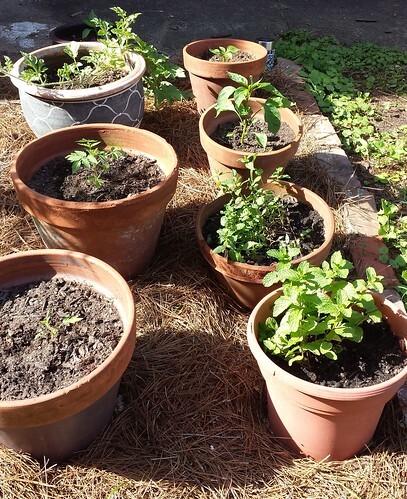 So I’m concentrating on tomatoes and herbs that they don’t like back there, like basil and mint. Nothing worked to deter them. The water jet spray, the repellent spray, the flashy hologram tapes hanging from the wire cages and fig tree and blueberry bush, all useless. I hope that I might at least get to eat some of my blueberries this year, but if I don’t, a friend is bringing me plenty from her yard. I don’t have the mental energy to trap them. 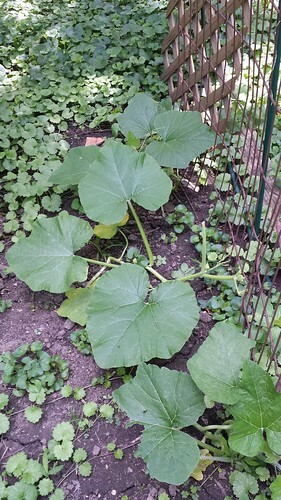 Curiously, the tromboncino squashes are doing quite well in the shade. I suppose that their flowers will be eaten by Woody and company, so I’m not expecting any harvest. 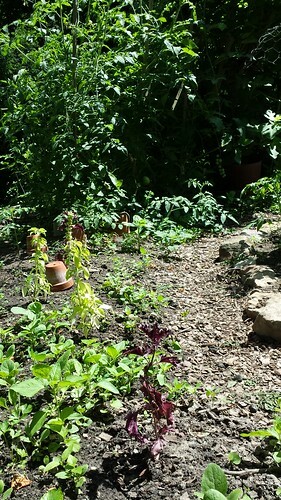 The hugelkultur bed is full of flowers, most not in bloom yet. There are a few hollyhocks that I’ll likely need to move next year. We’ll see. 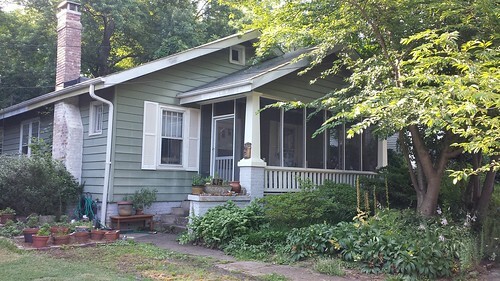 I’ve been moving some plants from the south side of the front yard over to this area since they will probably get trampled when the arborist takes out the silver maple tree in a couple of weeks. 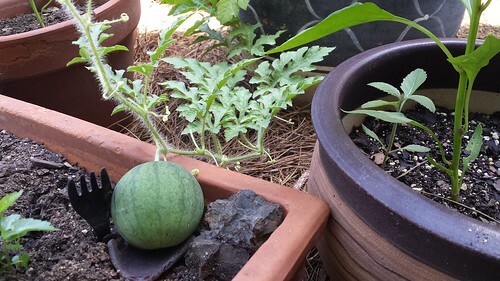 I have a tiny Sugar Baby watermelon and a few ripe cherry tomatoes. It will have to do for now. 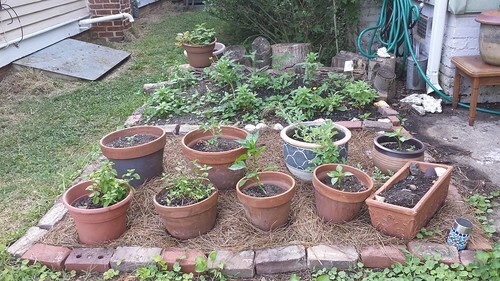 There will be plenty of Roma and Principe Borghese tomatoes for sauce and drying later this year, and it’s almost time to dig up my red potatoes. Okay, enough blogging. Studio time. What happened to Days One and Two? They went by in a flash and that’s okay. Sort/purge/organize one box/drawer/pile. Goal: five paper shipping boxes of stuff out of the studio. One small area weeded or tended in the garden. Today, I’ll probably clean and vacuum the front porch. We’ll see. Trying to stay off Facebook for the rest of the day. So far I have not played with my apron, so I’d like to do that today, sitting on my clean porch. The weather is lovely this week. I was able to turn off the air conditioning and even give the fans a rest. 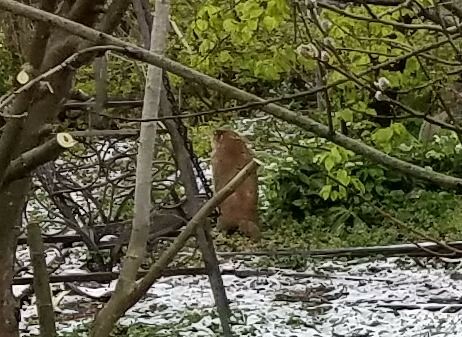 Yesterday, I spotted TWO groundhogs in the back yard! This wasn’t a big surprise, but I had not seen them at the same time before. So much for the water jet idea. They munched plants right around it. I don’t think that they are setting it off, although I hear it go off from time to time. They burrowed under a wire cage and ate the broccoli there, right in front of the motion sensor. My thinking is that this needs to be a year of observation and reassessment of how to handle this. I’m not fond of the idea of trapping and relocating them, but that is still on the table. I’m watching what they like to eat the most – all varieties of greens, lamb’s quarters, broccoli, certain varieties of beans (Jacob’s Cattle and Cannellini), the cucumber vines, celery, the watermelon blossoms, rudbeckia and sunflowers. They also like the wild yam vines and violets, and I wish that they would chow down on only those. 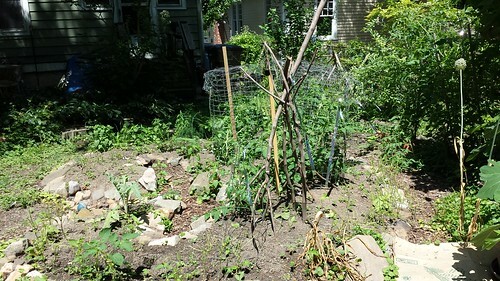 They are leaving alone, so far, the tomatoes, butterbeans, carrots, strawberries, pineberries, and herbs. Now that there is a sunny forecast, I’m going to spray the repellent again. I also hung reflective hologram tape all over the place. I’m sure that the woodchucks think it is pretty, but maybe we’ll save some blueberries from the birds for ourselves this year. Other than that, I’m trying to let it go. I enjoyed going through a box of fabric scraps and sorting and purging yesterday, and it makes me wants to do some more cloth strip weaving. Blogging takes up a LOT of time so I’ll probably skip that for the next couple of days. The tapestry diary is a scene from St. Simon’s Island in Georgia, where I went for the tapestry retreat. I’ve started it from the image in my head and will refer quickly to a photo later. On tap for later today, a massage and maybe a trip to the farmers’ market. Right now I’m listening to an audio panel about Enneagram types 8, 9, and 1. I’m a One, and I’ve been working with the Enneagram for about 12 years now. It makes more sense to me than any personality type system out there. Coffee’s gone, eggs, cheese grits, and leftover chili devoured. Listening to Michelle Wolf’s Netflix show in the background. She is really funny, but there’s a little too much screeching going on, so switching to Radio Heartland. Ah! Mountain Stage. That is perfect. Today is muggy and damp but so far no rain. Sandy finally gave up and bought a new lawn mower yesterday. I was amazed by two things this morning. One, the US Postal Service delivered my order from Pinetree Seeds that I ordered on Friday. On Sunday morning. On Memorial Day weekend. Two, I saw the groundhog on TOP of the fence munching on vines. Now I know that it can climb. The Pinetree package contained small animal repellent spray, holographic flash tape, and indigo seeds. I sprayed the rocks and planters and landscape timbers and pots, since the rain is supposed to hold off until tonight. The motion sensor is working on human sized animals, but I’m not so sure about smaller ones. This repellent contains “Putrescent whole egg solids, mint oil, rosemary oil, and cinnamon oil.” Maybe it will helpful with the skeeters too. Now I’m going to play in the studio today and tomorrow. Yesterday I only wove a little on my tapestry diary. Still wrapping my head around that and how to proceed, if at all. 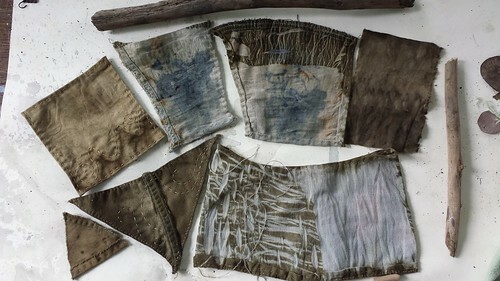 I dyed some iron/vinegar mordanted pockets in tap water with onion skins and the rest of the pitcher of red zinger tea. I wrapped up one with a sprig of deep purple plum leaves and another with the tea bags. The tea bags didn’t do much but the plum leaves worked blue magic. I soaked these in a really strong mordant for days so my colors are very dark. Love the olive color, though. Oh yeah, I busted the back of my new smart phone a week ago, so it is now held together with packing tape. It shattered across the lens of the camera. Fortunately, the only thing wrong with my old one is that it doesn’t hold a charge very long, so I kept it. I can still use it for a camera and it hooks up to wi-fi. I really can’t do much in this studio without cleaning up this mess, so I’m done here. I’ll post any progress on my little tapestry or the tapestry diary later. Tomorrow is another day off. So not only did I miss the march yesterday, I ended up with a headache that prevented me from doing any artwork, which was part of the reason WHY I didn’t want to go to the march. The rest of the reason is that sometimes I just have to have a day with solitude. No music, no talking, no noise, no expectations. My energy reserve ran out when I went to Deep Roots for the Taste Fair, and I came home and went to bed. Of course, the simplest reason is spring allergies. So I took an Allegra and drank elderberry tea with honey, washed out my sinuses with a neti pot. 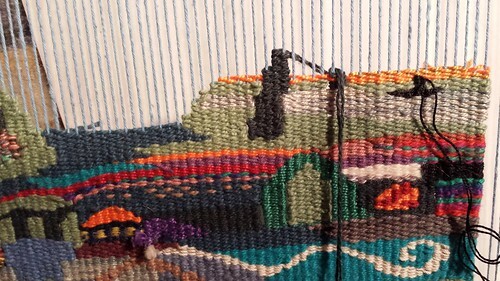 Then I sat on the sofa and did some simple stitching. All night long I woke up with numb hands. ARGH. Really, at this point, what the hell? 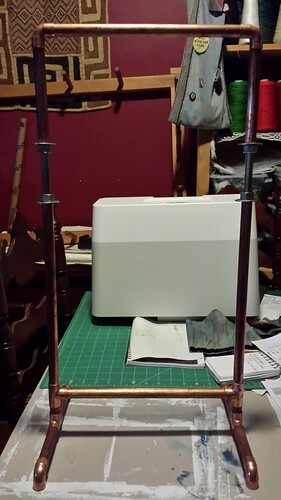 So I’ll set up this free-standing frame I purchased back when my hands were really bad to hold my fabric when I stitch. I have a new chiropractor who I’ll see on April 17, and will try to get a massage appointment with Tonya, who fixed me before but made me cry. The other bad news came this morning. I stepped out back to take another before photo of the Back Forty. As I turned to come inside, I saw him run across the yard and under that white building. When I looked at the photo and expanded it, there he is, on the left near the back. Yup. It’s back. Now I know who pooped in the pea bed. Now the friggin’ church bells across the street are playing “The Old Rugged Cross” which always reminds me of my mother. They play hymns twice a day during the week and more on Sundays.